I talk a lot about being critical of the mainstream. I’ve written a lot of critical things, like on the true meaning of the word “natural”, my own definition of paleo, my pregnancy and birthing experience, and on being contrary. But always—always—I see a lot of misunderstanding about what it means to be critical, and a lot of negative implications about it. 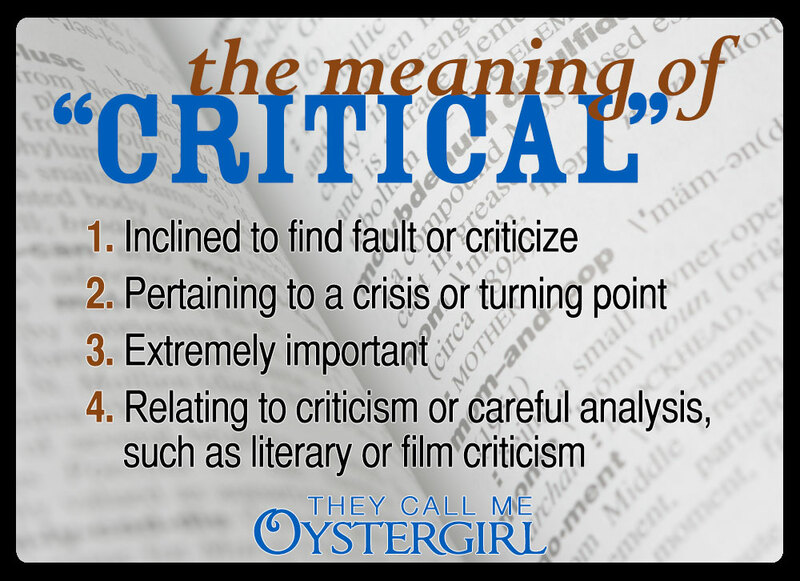 I think that, in our mainstream culture, the first definition (being judgmental, finding fault) is what most people think of and mean when they hear or say “critical.” The fact that it’s first supports that. It doesn’t have to be this pedantic. For me, it merely means “rigorous questioning.” It means not taking ideas or cultural norms for granted. It means deciding for myself, after careful consideration, what is true, rather than believing blindly the top-down knowledge of some hierarchy (see comments on dictionaries above)—and also allowing what is true at one moment to be superseded by another truth, should it be more relevant. It means thinking for myself, and not being complacent. While people may understand the importance of “critical thinking,” it often has a negative connotation, as though this definition of “critical” were synonymous with the first, as though being judgmental and using judgment were the same thing. Several definitions which have gotten problematically intertwined in our language. I wonder why? Some say that language fits the needs of the community, but others say it fits the whims of the powers that be. Could it be that the powers that be don’t want us to be critical (questioning/using judgment), and so have slowly demonized the act by demonizing its linguistic signifier by conflating it with being critical (finding fault/being judgmental)? I don’t like to sound like a conspiracy theorist, but sometimes you have to wonder. It is critical to be critical, but not critical. It is critical.